Looe Country Park is a family-run caravan and camping park near Looe and is perfect for visitors looking for a small quiet campsite. We are one of the smaller touring parks in Looe and our guests can be assured that they will receive personal attention and a warm welcome. If you're looking for a peaceful place to set up camp whilst touring south east Cornwall, don't miss out on this picturesque spot. Visit us to escape from the hustle and bustle of the city, and enjoy a relaxing holiday in the Cornish countryside with the quaint fishing villages of Looe and Polperro and sandy family beaches nearby. 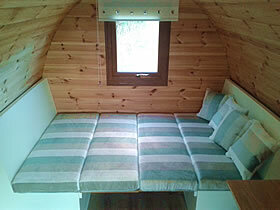 We have 2 brand new 3 bed Holiday Caravans available. These caravans have been positioned with views overlooking the Looe Valley toward St Austell. They have South facing decks, central heating, full size fridge/freezer and 2 bathrooms. Please check our booking system for availability or give us a call. We have 5 static caravans for hire which are all extremely well maintained and equipped to a high standard. 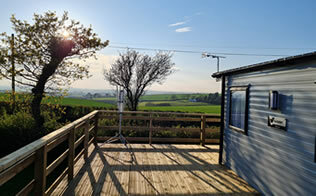 Each static caravan has its own raised deck area with patio furniture and views over unspoilt countryside. 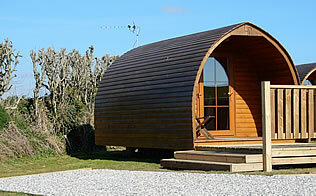 For those who wish to experience the outdoors in comfort, why not book one of our camping pods. Each of our camping pods is equipped with a lovely soft double bed plus TV and an outside decking area for eating and sunbathing. We offer larger than average touring pitches with space for an awning and car beside your caravan. 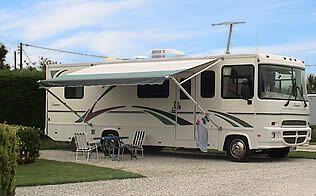 There are hardstanding pitches and grass pitches, some with gravel awning stands. The pitches are positioned around the perimeter of the park. They are divided every second pitch by a hedge to afford a little privacy. If you are looking for a quiet, peaceful holiday in Cornwall, then Looe Country Park is the place for you. For your comfort and peace, we do not accept large all male/female groups that may disturb the peace of the park nor do we allow dogs considered to be dangerous breeds. We have a small shop on site where you can buy bread, milk and other essentials. We also sell camping and caravan equipment, from pumps to plugs, and we are calor gas and camping gaz stockists. We aim to ensure that your holiday with us is as enjoyable and carefree as possible and we are happy to do everything we can to help you enjoy your time with us. If you are looking for an immaculately kept campsite, Looe Country Park is one of those holiday parks that will not disappoint. 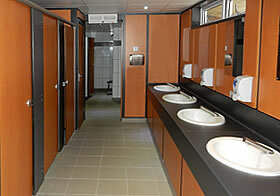 Our superb, modern heated washroom and shower block and laundry room equipped with industrial size washing machine and dryer are kept immaculately clean at all times. A lovely warm welcome after a long drive, spotless static caravan and a beautiful site. Enjoyed visiting local towns but just as enjoyable were the local walks. Hope to come back in the future!